During an intense bombardment Corporal Joseph Thomas Kaeble MM (Quebec Regiment) remains at the parapet with his Lewis gun shouldered ready for action, the field of fire being very short. As soon as the barrage lifts from the front line, about fifty of the enemy advances towards his post. By this time the whole of his section except one has become casualties. Corporal Kaeble jumps over the parapet, and holding his Lewis gun at the hip, empties one magazine after another into the advancing enemy, and although wounded several times by fragments of shells and bombs, he continues to fire and entirely blocks the enemy by his determined stand. Finally, firing all the time, he falls backwards into the trench mortally wounded. While lying on his back in the trench he fires his last cartridges over the parapet at the retreating Germans, and before losing consciousness shouts to the wounded about him: “Keep it up, boys; do not let them get through! We must stop them” The complete repulse of the enemy attack at this point is due to the remarkable personal bravery and self-sacrifice of this gallant non-commissioned officer, who will die of his wounds tomorrow. Lieutenant Robert Reginald Richardson and his observer Lieutenant Hurst sight a U boat on the surface at 56.43 north 42 west. The U-boats periscope is still visible when they reach it and they drop two 230-pound bombs, which reportedly bring up oil and bubbles. HMS Zennia and an American destroyer rescue the survivors of the Cunard liner Ausonia which was sunk last month some six hundred twenty miles west of Fastnet. Forty-four crew members of the liner have been lost and the survivors have sailed some nine hundred miles in five lifeboats. Captain R Capper of the Ausonia will be awarded the Distinguished Service Cross for his actions. Mrs. Catherine Stamp of Gloucester loses both her 50-year old husband Thomas and 16-year old son Richard when the merchant ship SS Olwen is sunk. Thomas was the Master of the ship, while his son served as the cook. 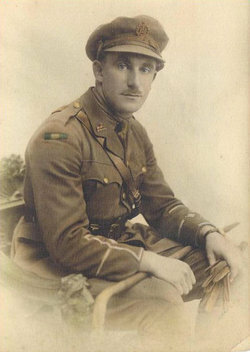 Lieutenant Colonel Gerard Chipchase Roberts (commanding 14th Gloucestershire Regiment) is killed at age 42. His son will be killed at Dunkirk in May 1940 and his brother was killed in October 1915. Captain William Fraser Hale (Canadian Army Medical Corps) is killed in action at age 40. He is the son of the Reverend Joseph Hale. Second Lieutenant Edwin John Leat (Dorsetshire Regiment) is killed at age 33. He is a first class cricket player for Somerset. Second Lieutenant Samuel Hollis Alfred D’Arcy DSO (Royal Air Force) is accidentally killed flying at home at age 19. He is the son of the Viscount D’Arcy. Private Herbert Scott (Australian Infantry) is killed in action at age 33. His two brothers have been killed previously in the Great War. Private Charles Sallabanks (Machine Gun Corps) is killed at age 19. His brother was killed in April 1916.